Using ESA’s Herschel Space Observatory, a team of astronomers has found first evidence of a noble-gas based molecule in space. A compound of argon, the molecule was detected in the gaseous filaments of the Crab Nebula, one of the most famous supernova remnants in our Galaxy. While argon is a product of supernova explosions, the formation and survival of argon-based molecules in the harsh environment of a supernova remnant is an unforeseen surprise. Just like a group of people, the periodic table of chemical elements has its share of team players and loners. While some elements tend to react more easily with other species, forming molecules and other compounds, others hardly ever take part in chemical reactions and are mainly found in isolation. ‘Inert’ elements par excellence are the noble gases: helium, neon, argon, krypton, xenon and radon. The name of one of them – argon – derives from the Greek word for idle, to emphasise its highly inert nature. But noble gases are not entirely inactive. While at first scientists doubted that chemical compounds could even contain noble gases, several such species are now known and have been extensively studied in the laboratory. Things are more complex in space. Over the decades, astronomers have detected atoms and ions of noble gases in a variety of cosmic environments, ranging from the Solar System to the atmospheres of stars, from dense nebulae to the diffuse interstellar medium. But the search for noble-gas based compounds had until now proved unsuccessful, suggesting that these almost inert elements might have a hard time reacting with other species in space. A new study, led by Michael Barlow from University College London, UK, and based on data from ESA’s Herschel Space Observatory, has found the first evidence of such a compound in space. The results are published in the journal Science. The team of astronomers has detected emission from argon hydride (ArH+), a molecular ion containing the noble gas argon, in the Crab Nebula. A wispy and filamentary cloud of gas and dust, the Crab Nebula is the remnant of a supernova explosion that was observed by Chinese astronomers in the year 1054. “At first, the discovery seemed bizarre,” comments Barlow. “With hot gas still expanding at high speeds after the explosion, a supernova remnant is a harsh, hostile environment, and one of the places where we least expected to find a noble-gas based molecule,” he adds. Argon hydride is produced when ions of argon (Ar+) react with hydrogen molecules (H2), but these two species are usually found in different regions of a nebula. While ions form in the most energetic regions, where radiation from a star or stellar remnant ionises the gas, molecules take shape in the denser, colder pockets of gas that are shielded from this powerful radiation. “But we soon realised that even in the Crab Nebula, there are places where the conditions are just right for a noble gas to react and combine with other elements. “There, in the transition regions between ionised and molecular gas, argon hydride can form and survive,” explains Barlow. 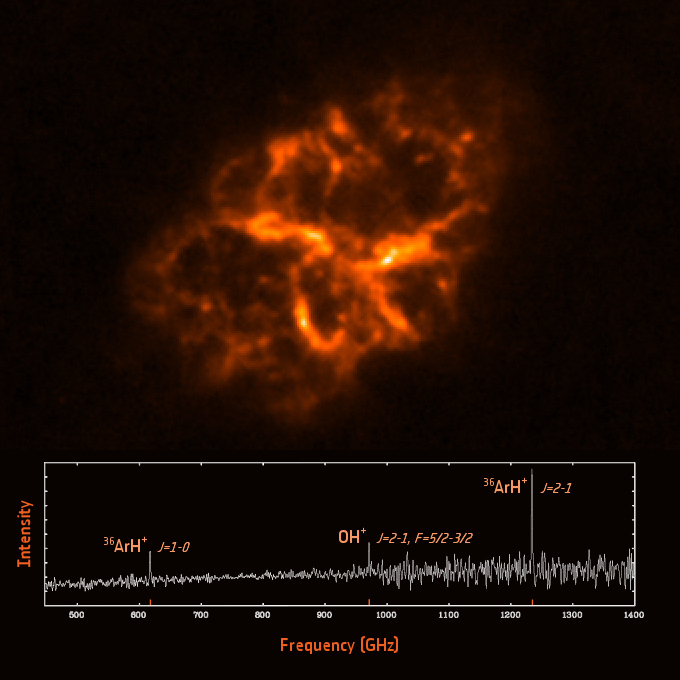 This new picture was supported by the comparison of the Herschel data with observations of the Crab Nebula performed at other wavelengths, which revealed that the regions where they had found ArH+ also exhibit higher concentrations of both Ar+ and H2. There, argon ions can react with hydrogen molecules forming argon hydride and atomic hydrogen. In the partly ionised gas filling these regions, molecules collide frequently with ions and free electrons. These collisions excite the molecular structure of ArH+ making it rotate; in turn, molecular rotations produce the emission features detected in the spectrum of the Crab Nebula by Herschel. 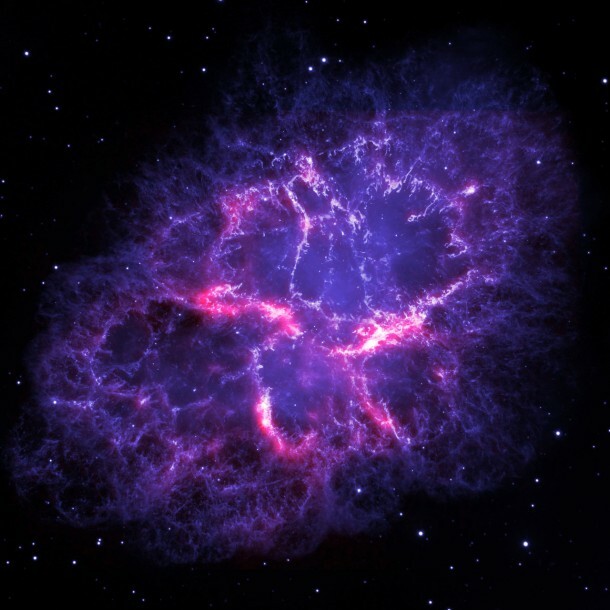 “The discovery was truly serendipitous: we were observing the Crab Nebula to study its dust content. But then, on top of the emission from dust, we found two emission lines that had never been seen before,” says co-author Bruce Swinyard, also from University College London. The identification of these lines was a challenging task. To this end, the astronomers exploited two extensive databases of molecular spectra and, after lengthy investigation, they matched the observed features with two characteristic lines emitted by ArH+. “And there’s icing on the cake: from a molecule’s emission, we can determine the isotope of the elements that form it – something that we can’t do when we see only ions,” adds Swinyard. The Herschel data indicate that the argon hydride found in the Crab Nebula is made up of the argon isotope 36Ar. This is the first time that astronomers could identify the isotopic nature of an element in a supernova remnant. “Finding that argon in the Crab Nebula consists of 36Ar was not surprising because this is the dominant isotope of argon across the Universe. “And it’s also the main argon isotope to be synthesised in the nuclear reactions during supernova explosions, so its detection in the Crab Nebula confirms that this iconic nebula was created by the explosive death of a massive star,” explains Barlow. The astronomers are planning further observations with other facilities to seek new emission lines in the Crab Nebula’s spectrum, possibly from molecules containing different isotopes of argon. The detection of such a molecule would enable them to study the ratio of different isotopes produced by supernovae and to learn more about the nuclear reactions that take place when a massive star dies. “This is not only the first detection of a noble-gas based molecule in space, but also a new perspective on the Crab Nebula. Herschel has directly measured the argon isotope we expect to be produced via explosive nucleosynthesis in a core-collapse supernova, refining our understanding of the origin of this supernova remnant,” concludes Göran Pilbratt, Herschel Project Scientist at ESA. The results described in this article are reported in “Detection of a Noble Gas Molecular Ion, 36ArH+, in the Crab Nebula”, by M. J. Barlow et al., published in Science, 342, 6163, 1343-1345, 13 December 2013. DOI: 10.1126/science.124358213. The argon isotope found in the Crab Nebula is different from the one that dominates in Earth’s atmosphere, 40Ar, which derives from the decay of a radioactive isotope of potassium (40K) present in our planet’s rocks. At almost one per cent, argon is the third most abundant gas in the atmosphere of Earth after nitrogen and oxygen, and was discovered at the end of the 19th century. The study is based on data collected with the Spectral and Photometric Imaging Receiver (SPIRE) on board ESA’s Herschel Space Observatory. The team of astronomers detected two emission lines corresponding to the first two rotational transitions of argon hydride (ArH+) at frequencies of 617.5 GHz and 1234.6 GHz, respectively. To identify the lines, they made use of two extensive databases of molecular lines: the Cologne Database for Molecular Spectroscopy (CDMS) and the Madrid Molecular Spectroscopy Excitation (MADEX) code. The SPIRE instrument contains an imaging photometer (camera) and an imaging spectrometer. The camera operates in three wavelength bands centred on 250, 350 and 500 µm, and so can make images of the sky simultaneously in three sub-millimetre colours; the spectrometer covers the wavelength range between 194 and 671 μm. SPIRE has been developed by a consortium of institutes led by Cardiff Univ. (UK) and including Univ. Lethbridge (Canada); NAOC (China); CEA, LAM (France); IFSI, Univ. Padua (Italy); IAC (Spain); Stockholm Observatory (Sweden); Imperial College London, RAL, UCL-MSSL, UKATC, Univ. Sussex (UK); Caltech, JPL, NHSC, Univ. Colorado (USA). This development has been supported by national funding agencies: CSA (Canada); NAOC (China); CEA, CNES, CNRS (France); ASI (Italy); MCINN (Spain); SNSB (Sweden); STFC, UKSA (UK); and NASA (USA).